Fox News Host to Women: Don't Vote, Go Back on Tinder! OMG, guys. Voting is so hard. If you need another compelling reason to participate in democracy next Tuesday, November 4 (ahem, Election Day), might we suggest you add "vote to smite Fox News" to the list? Recently, Fox News' The Five host Kimberly Guilfoyle (seriously, Gulf Oil?!) shared some hard-nosed advice for all the young women who might be thinking of casting a vote in the midterm elections: Don't do it. Just "go back on Tinder or Match.com," Guilfoyle told her co-hosts, and the world. Guilfoyle also thinks that our immaturity and constant-smart-phone-swiping render us unfit for jury duty as well: "It's the same reason why young women on juries are not a good idea," she explained. "They don't get it!" "They're not in that same life experience of paying the bills, doing the mortgage, kids, community, crime, education, health care. They're like healthy and hot and running around without a care in the world," Guilfoyle added huffily. It's true that elections do tend to make our feeble lady-brains sore: "Is Measure FF hot or not?!" "Would I make out with this anti-violence program measure in a dry-goods closet!?" Ugh, politics is hard! We think it's sort of refreshing that Republicans have slightly revised their standard creed of telling women to "get back in the kitchen." "Get back on Tinder" has a certain ring to it, does it not? 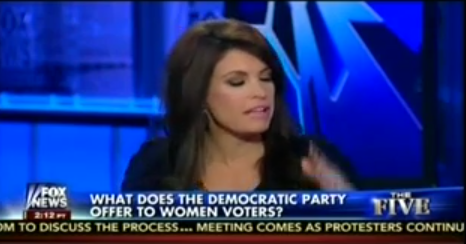 Even if Fox's gender politics are from the nineteenth century, at least it's using appropriate app references. Watch below, and then go out and vote, ladies! Think of what a great story it'll make for your next Tinder date. Plus, it burns, like, four calories!